The Deluxe Hand Trucks incorporate all the fine features of the standard hand truck line plus offers tubular steel stariglides. Stairglides, a feature found on much costlier units, makes climbing stairs and surbs effortless. 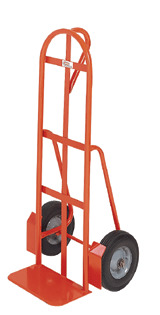 Deluxe Hand Trucks are available with a one pin, two pin or loop handle in 46" and 50" heights. 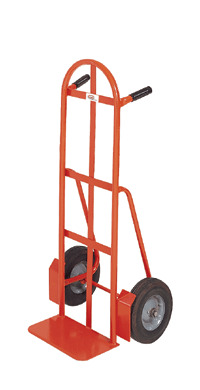 All models offer a cushion ride on top of 10" semi-pneumatic or full pneumatic ball bearing wheels; orange enamel finish.